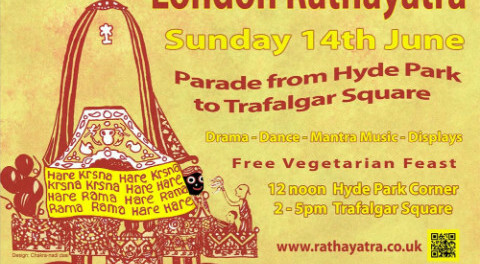 What is the festival of Ratha Yatra? 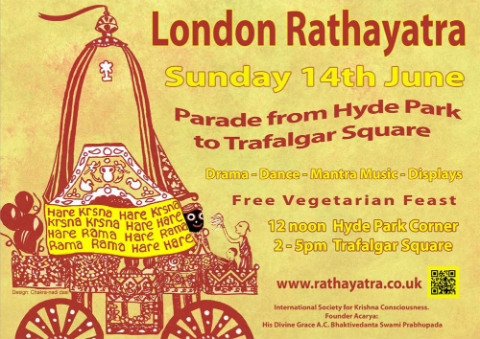 June 14 marks the 47th annual Ratha yatra (festival of chariots) in London. The journey begins at 11:30am at Hyde Park. Upon arrival, expect to find three colourful carts with equal numbers of kirtan (singing and dancing) sections. Individuals are invited to pull on ropes attached to the carts (to signify liberation). Some devotees believe that this task helps them carry their deity into the next life and grants them a place in the spiritual world. It arrives at Trafalgar Square for 2pm before concluding at 5pm. Nor is it a London-specific event, as celebrations happen in Leicester, Birmingham, Brighton and Manchester. But why is this festival important? Not only is the event one of the oldest known cultural celebrations, it united devotees of Krishna (worshipped as Jagannath) globally. The deity of Jagannath is considered an incarnation of Krisha. It is not uncommon to find depictions of Jagannath represented as a carved and decorated stump – with stumps for arms and large eyes – but no legs. The festival celebrates Jagannath’s annual visit to Gundicha Mata’s temple. During the procession, idols of Puri Jagganath, Balabhadra, and Subhadra are also placed into the chariots. Women typically carry bowls of flaming camphor and some men lie on the street and roll behind the chariot as a mark of respect. For thousands of years, millions have taken to the streets of Jagannath Puri, India. The skyline is dwarfed by a 200-foot temple to worship Lord Jagannath. The procession (yatra) affords a person darshan (auspicious viewing) a glimpse of the deity, who, because of caste or sectarian restrictions, are not permitted access to the temple or sanctuary. For devotees, the chant of “Hare Krishna” echoes in unison as a means to connect with their deity. Some also choose to wear a forehead marking (tilak) – made from sacred clays in India. So we wish our readers a joyful Ratha yatra celebration. Is the For Public Purity campaign a hoax?